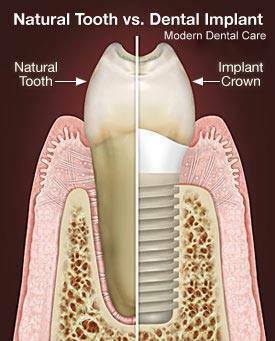 A dental implant serves as a replacement for the root/roots of a tooth. Dental implants are not visible and secured in the jawbone once they are placed. Dental implants are used to fix crowns, bridges or dentures.Their titanium structure is lightweight, strong and not rejected by the body ( biocompatible ). Titanium and titanium alloys are the most widely used metals as in dental as well as in orthopedic joint replacements. The success rate of dental implants is the highest among any implanted surgical devices. Titanium special characteristic is a merge to a bone/osseointegration (“Osseo” – bone; “integration” – fusion with), which is the basis of dental implant success.Dental implants stabilize the jaw bone, prevent its loss, help maintain the jawbone’s shape and density. Dental implants also support the facial skeleton and, intermediately, gum tissues, cheeks, and lips. They help you look natural: eat, chew, smile, talk. The dental implant procedure is a team effort between a dental surgical specialist with advanced training in implant surgery and a dental laboratory technologist who plans and fabricates the tooth restorations. Implant placement requires a detailed assessment of your mouth and jaws: study models of your mouth and bite, and specialized radiographs (x-rays), which may include 3D scans(3D Panoramic X-ray). These records will show exactly place where and how your implant should be placed. Who can consider dental implants? In general, if you have lost tooth/teeth you are a candidate for dental implants. It is important that you are in good health, however, as there are some conditions and diseases that can affect if dental implants can be a good option for you. may influence if dental implants will integrate to your bone. Dental surgeon will ask about your medical history (past and present) and about all medications you are taking. What is Sinus Augmentation (lift)? The crucial factor for the implant is a quality of the bone where it is to be installed. Poor bone quality and quantity and the closeness to the sinus makes the upper back jaw one of the most difficult areas to place dental implants. Sinus lift can help fix this problem. The procedure of bone grafting surgically raises the sinus floor to grow additional bone for a dental implant to be placed. It will take 4-12 months the bone to develop before implants can be installed. In some rare cases, the implant can be placed at the same time the sinus is augmented. The upper or lower jaw deformation can also be a cause luck of bone for dental implants placement. 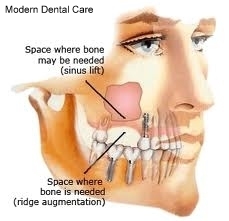 To fix the deformities, the gum will be cut and lifted away from the ridge so that the defect in the bone will be exposed and then filled with a bone substitute or bone to improve the structure of the ridge. Bone graft procedure shows appreciably improvement appearance and raises your chances for life-long implants. Teeth require at-home maintenance and regular dental check-ups. Dental implants need the same care as your own teeth: brushing and flossing. At Modern Dental Care Mauritius we use “Zimmer” dental implants. To know more about dental implants in Mauritius contact us and book an appointment.